How Expensive Are Garden Swimming Pools? Whilst having a private pool at your Spanish home might push the value up, the same certainly isn’t true in Britain. In fact, a badly and ill-thought pool can actually devalue your home, with potential buyers having to consider the costs of removing the swimming pool entirely. As a result, it is essential to do your homework and plan your pool accordingly. If you have no intention of moving, and see building a pool as an extension to your dream home, there should be nothing to stop you. The site of a garden swimming pool is important; for example, you want to build it in a place where it will catch the most daylight. You also need to keep it far away from trees, particularly deciduous ones, as otherwise you’ll spend your entire life removing leaves. If you’re looking for a simple pool, it’s wise to choose an above-ground product. These are also the cheapest solution, and are ideal if you’re looking to keep costs down. In addition, they’re easy to remove, so though a badly positioned pool might still negatively affect your home’s value it won’t cause as much of a problem as an in-ground model. Many above-ground pools start at a relatively cheap £2,500 for a 12ft by 24ft product. If you’ve got a little experience with DIY, they’re also fairly easy to put up yourself, meaning you can enjoy your swimming pool without paying out a small fortune. It’s important to remember, however, that these aren’t the beautifully landscaped pools you’ll see in many brochures. In fact, these often look more like a large paddling pool, and though you can do some landscaping to help smooth the transition from pool to garden, it will never be the stunning aesthetic many people look for. The traditional swimming pool is an in-ground model that allows you to seamlessly walk across your patio and plunge straight into the awaiting warm waters. That’s the dream, right? There are many innovative and chic modern designs to help create gorgeous pools, including those that are built beneath your garden and include a hard, functioning cover to maximise your outside space. Costs vary widely for in-ground pools. For example, a budget self-build start kit can often be bought for just £5,000. However, if you intend to do the work yourself, you’ll need some substantial building knowledge to get the project off the ground. You’ll also need to draw up a precise budget because once all the labour, excavation work and additional costs are considered, it might be worth having a professional team come and install the swimming pool for you. The cost to have a pool installed start at around £15,000 for a simple in-ground liner. If you want something a little flashier, you should expect to pay a minimum of £25,000 for a mosaic tiled concrete pool. Though this might seem rather expensive, if you’re not competent in DIY, it can offer a lot of peace of mind to know it’s been properly installed. In addition, if you take into account potential leaks or other problems you might encounter putting the pool in yourself, DIY might be a false economy. Your use of contractor will have a large effect on the price because labour can be an expensive part of any project. Firstly, it’s wise to use a website like Rated People to find local professionals who’ve got a track record of being trusted and reliable. You can then negotiate a reasonable price and ensure you’re not getting ripped off. Secondly, you should ensure that any professionals you hire are registered members of the Swimming Pool and Allied Trade Association (SPATA). This means you’ll get warranty insurance cover and will be financially protected in case your contractors don’t complete the project for any reason. If they’re installed correctly, small garden pools can be a great feature for any British home. It’s important to ensure, however, that you’re ready to pay the right price to get a swimming pool you’ll enjoy for years to come. Get FREE Swimming Pool Quotes Today! 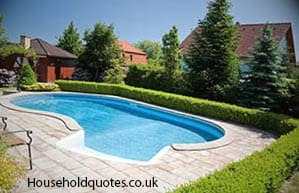 Get Your FREE Swimming Pool Quotes NOW!